I have been in the mood to make granola lately and I found the time to squeeze it in between laundry and dinner tonight. Sorry I haven't posted this before because it's truly great! I was never a granola eater in my younger years but over the last year I have perfected (at least to me and my family) the art of great granola. So make a batch and let me know what you think. Place all ingredients in a large bowl and have fun mixing until combined. I always end up using my CLEAN hands. Pour the granola onto a cooking sprayed baking sheet (I use a full sheet pan for this) and spread around until it is in a nice single layer. Bake for 40 minutes stirring every 10 minutes. 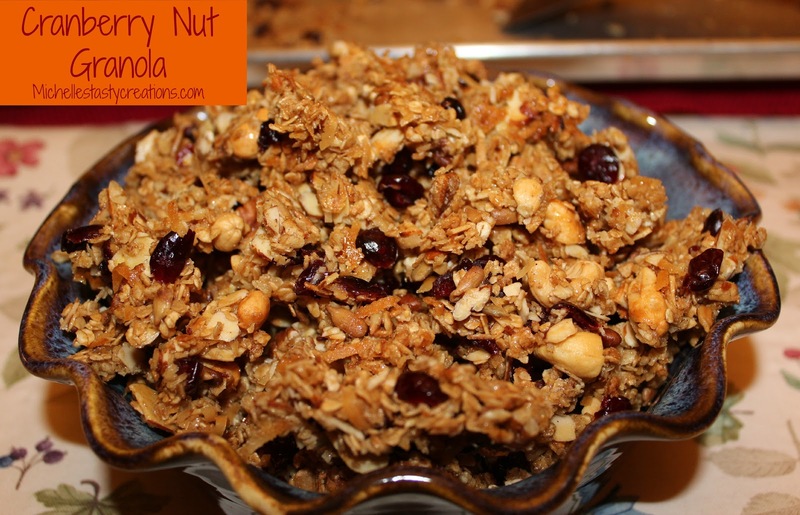 I use a large metal spatula and turn the granola over every 10 minutes for even cooking. You'll be amazed at how it turns a beautiful brown color in the last 10 minutes. Every time I make this I think I got the temperature wrong until I take it out of the oven and it has miraculously browned. Cool for 10 minutes on the tray and then break up into smaller pieces. Great on yogurt, ice cream, as cereal or just all by itself! I'm so glad I found your recipe Michelle! This sounds a lot like what I do but since I never measure, I don't know what I'm going to end up with. Usually it's not half bad. Now I have a go to recipe and will most likely be more satisfied with the results!!! Thanks!